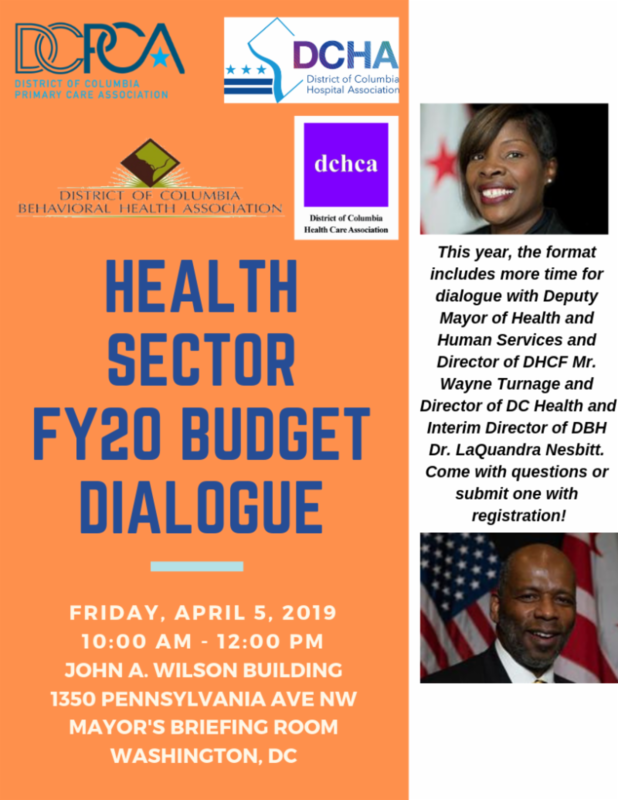 Overview: DCPCA announces the 6th Annual Health Sector Budget Briefing on Friday, April 5, 2019, from 10 AM to 12 PM at the Wilson Building 1350 Pennsylvania Avenue NW, Suite G-9. Hosted by DCPCA, the DC Hospital Association, DC Behavioral Health Association, and the DC Health Care Association, the event will be an opportunity to engage directly with health sector department leaders regarding policy, priorities, and partnerships in the FY20 budget. For more information contact Emily Long, DCPCA, at elong@dcpca.org. Training Overview: Make the most of your BridgeIT reporting with DCPCA's Interactive BridgeIT Designer Training. Participants will learn to create customized BridgeIT reports, learn how to import and customize canned reports from the Warehouse and learn best practices for securely distributing this data to necessary personnel. Anyone interested in participating should contact Mike Smoot, EHR Data Manager at msmoot@dcpca.org. Training Overview: During this session we will answer follow up questions from the Day 1 training, review the take home BridgeIT Exam, create a 2nd custom report as a group and have a final question and answer period to wrap up. 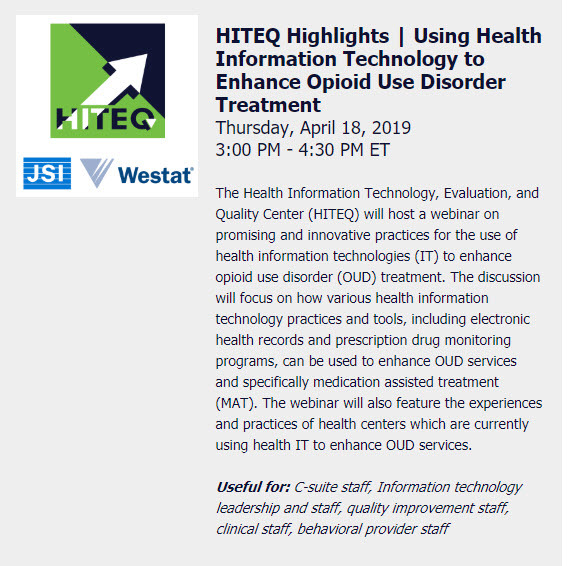 Anyone interested in participating in the Follow-Up to Introduction to BridgeIT Designer Training should contact Mike Smoot, EHR Data Manager at msmoot@dcpca.org. Look out for more information and registration details. Training Overview: The Quality Improvement (QI) Boot Camp is geared towards any health center staff that support quality improvement, including both clinical and administrative staff. Attendees will have the opportunity to discuss key QI principles including the Model for Improvement, PDSA process, SMART goals, and quality measures. We will apply the concepts learned to real-life case studies through hands-on group exercises. For more information contact Megan Loucks, DCPCA, at mloucks@dcpca.org. Hosted by DCPCA and Health Efficient, join this two-day convening of health center staff to share best practices and learn from subject matter experts. Staff across our 25 member Qual IT (HCCN) collaborative will be in attendance. Our most recent conference, held in September in Silver Spring, had a successful turnout of 110 health center members from across our HCCN/Qual IT network. The final agenda is forthcoming. 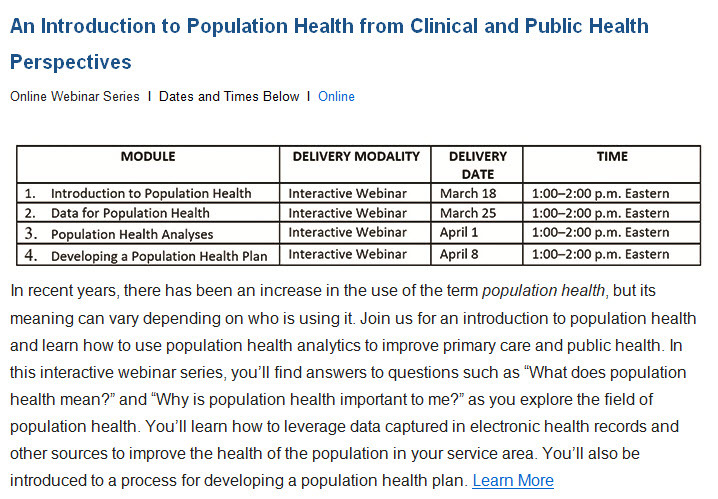 As a preview, sessions will include: Care Management Tips and Techniques, Meaningful Use Stage 3, Best Practices for Hypertension, Value-Based Payment in Action, IT Security, eCW Population Health Basics, CMO Roundtable, Risk Stratification. 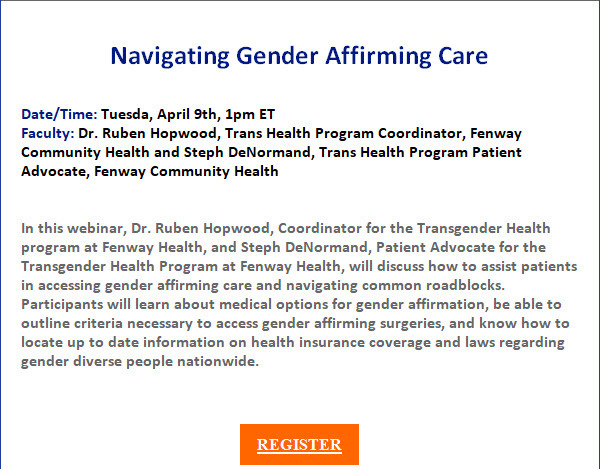 There is no charge for staff of Qual IT member health centers to attend this conference. In fact, to help with travel and accommodations, DCPCA is offering a $500 stipend per health center organization. If you have any questions regarding the upcoming QualIT Spring Conference contact Berlinda Olivier, DCPCA, at bolivier@dcpca.org. Are you familiar with ImmunoCAP, an IgE blood test for allergies? ImmunoCAP identifies allergic triggers. Knowing the specific triggers allows clinicians to provide recommendations to reduce symptoms and asthma exacerbations. NIH recommends IgE testing and other actions for all patients with persistent asthma. ImmunoCAP is available to DC providers and covered by health insurance. Call your LabCorp representative or Trish Hartford at hartfop@LabCorp.com p) 202-770-7931 to schedule a comprehensive training session for your providers regarding Allergy Testing for Asthmatic Patients. This training will introduce ImmunoCAP and discuss how to read results, and incorporate knowledge of allergic triggers into standardized protocols for asthma care. Make the most of your BridgeIT Reporting with DCPCA's one-on-one interactive BridgeIT technical assistance sessions. To schedule your "BridgeIT Designer/Viewer" technical assistance session, contact Mike Smoot, EHR Data Manager at msmoot@dcpca.org . Trainings can be customized to fit specific groups at your facilities and can be tailored to meet the needs of your organization. For additional information, please contact Michelle Ezeofor, Emergency Preparedness Program Manager, at mezeofor@dcpca.org or call (202)552-2345. DCPCA has partnered with the American Heart Association (AHA) to offer an in-person training titled "A Team-Based Approach to Blood Pressure Control" for our member health centers. This training is facilitated by Dr. Richard T. Benson, Associate Medical Director of Stroke at the MedStar Washington Hospital Center with the NIH Stroke Program. For additional information please contact Berlinda Olivier, Quality Improvement (QI) Specialist at bolivier@dcpca.org. D iabetes affects more than 30 million people in the United States. In addition to higher prevalence, ethnic and racial minority patients with diabetes have higher mortality and higher rates of diabetic complications. 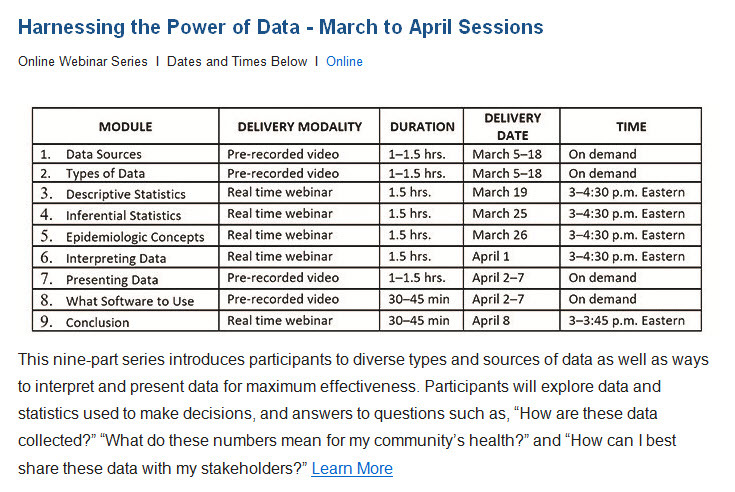 13 National Cooperative Agreement (NCA) organizations have partnered to create a four-part national learning webinar series to increase foundation knowledge of effective strategies to prevent, treat, and manage diabetes among special and vulnerable Health Center Program patients. For more information about this eClinicalWorks training contact Michelle Tropper, Director of Clinical Programs at mtropper@healthefficient.org. This publication is supported by the Health Resources and Services Administration (HRSA) of the U.S. Department of Health and Human Services (HHS) as part of an award totaling $565,223. The contents are those of the author(s) and do not necessarily represent the official views of, nor an endorsement, by HRSA, HHS, or the U.S. Government. For more information, please visit HRSA.gov.